still frozen, but the shrimp, alas, were not. tablespoons of sherry and set it aside. stir-fried it all together for 30 seconds. computer, trying to figure out how to fix shrimp tomorrow. Any ideas????? Let’s see: jambalaya, tod mun goong, pâté, potted, or a classic shrimp salad w/ herb mayo. Enjoy your bounty! Another delicious way to serve prawns which I ‘borrow’ for tonights supper as I managed to score some raw prawns yesterday! Why don’t you pickle them? That’s what I’ve been planning on doing this week. Sounds like a great way to solve a long term storage problem! The other night, I sauteed olive oil, saffron and shrimp and tossed it with angelhair pasta. Ok, let’s see, what about a mild curry made with some coconut milk and served with basmati rice? This is what my mother used to call “a good problem to have.” It’s fairly common, but shrimp and macaroni salad is a big favorite in my family. Jambalaya, curry, risotto — and then steam the rest and keep them cold in the fridge to add to salads. Have fun! You guys are the best. As it happened, I was shrimped out and didn’t do anything at all with them last night and we are going out to dinner tonight, so I think I will take combine your suggestions and steam them — then pickle half and save the rest for a Thai curry tomorrow. I’d make a risotto in a heartbeat, but I am trying to eat light as much as possible. Darn! hey – a simple one. Saute a bunch of garlic, add shrimp and saute until done – reserve. Add really good chopped tomatoes, some white wine (red pepper flakes if you like)and simmer until thickened. 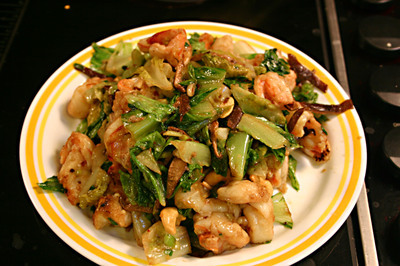 Add fresh basil, plate and serve shrimp on top. Smoked, silly! :-0 To 125F, 130F was 5 degrees too many, 120 5 degrees too few. Try a pot of shrimp bisque; it freezes well!